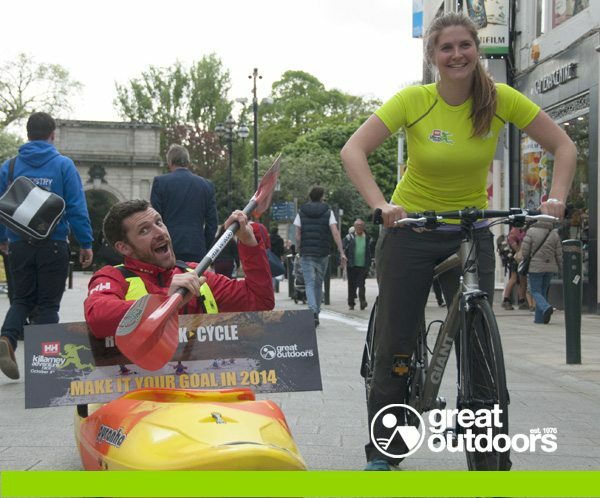 Helly Hansen Killarney Adventure Race teams up with Great Outdoors for this year’s race on October 2014. The Helly Hansen Killarney Adventure Race today announced a partnership with outdoors shop, Great Outdoors. The deal sees Irish owned store Great Outdoors become retail partner for the race, which has become Ireland’s largest adventure race, and one of the largest in the world. The Helly Hansen Killarney Adventure Race takes place on Saturday 4th October and is a multi-adventure sport event, comprising running, hiking, cycling and kayaking. There are three different route options, 70km, 60km, or 27km, to suit all levels. Adventure racing is an increasingly popular sport worldwide androutes tend to be a real test of endurance and mental strength for all levels of outdoor fitness enthusiast. Over 2,500 people take part in the Helly Hansen Killarney Adventure Race every year, on a route encompassing some of the most dramatic, breathtaking and remote scenery in the world. A Channel 4 documentary team undertook the race last year, and the show was featured on Channel 4 and Sky Sports in the UK, and later broadcast all over the world. The partnership between Helly Hansen and Killarney Adventure Race is now in its third year. All participants receive branded technical Helly Hansen gear, with Helly Hansen prizes for the top competitors in different categories. This event is organized by Killarney based Elite Event Management and is supported by Fáilte Ireland and The Gleneagle Hotel. Our media partner is the Sunday Times.